Heavy duty deisgn with a rugged construction for daily use by professionals in tough working envi..
Used for levelling and maneuvering tarmac and a variety of loose materials. 600mm Aluminium hea..
Used for levelling and maneuvering tarmac and a variety of loose materials. 600mm Wooden Blade .. 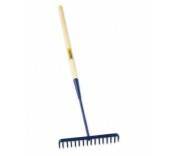 The Manchester Safety Services range of rakes and spazzles have been designed to assist on a range of terrains. The high quality of the rakes and spazzles ensure all of the products in the range offer consistent and durable assistance when clearing and preparing a work site. The ergonomic design of the rakes and spazzles in the Manchester Safety Services range ensures they can be used for prolonged periods of time without discomfort – ideal for work sites looking to get extensive use from the products. Designed to be robust and durable – the rakes and spazzles can endure significant wear and tear when completing difficult tasks. From manoeuvring tarmac to levelling asphalt, a wide range of heavy duty jobs can be completed with the assistance of the rakes and spazzles in this range. For more information about any of the products in this range, contact our dedicated team on 01706 364943.